The AGM-86B Air Launched Cruise Missile (ALCM) were developed to increase the effectiveness of the B-52 Bombers. In combination, they dilute an enemy’s forces and complicate defense of its territory. 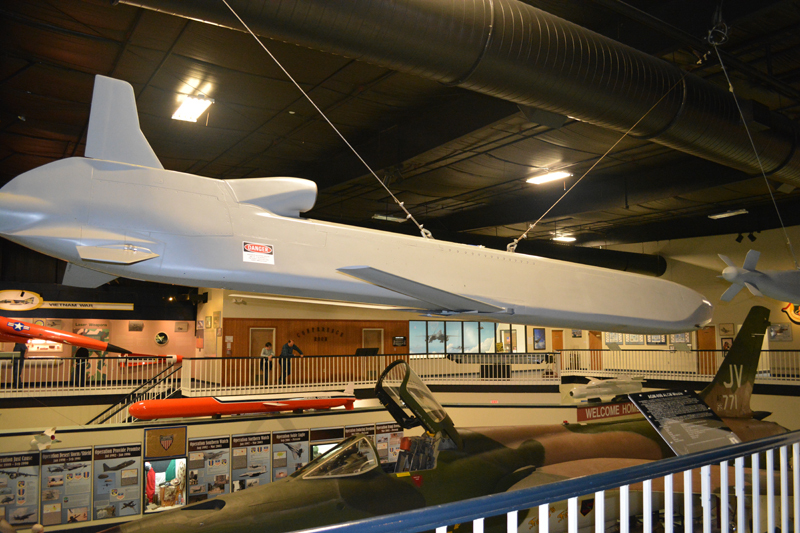 In February 1974, the Air Force entered into contract to develop and flight-test the prototype AGM-86A, which was slightly smaller than the B and C models. The 86A model did not go into production. In January 1977, the Air Force began full-scale development of the 86B model. Initial production began in 1980, a total of 1,715 missiles were completed by October 1986. In June 1986, a limited number of 86Bs were converted to carry a high explosive blast/fragmentation warhead – these were re-designated -86Cs. The small, winged AGM-86B is powered by a Williams F-107-WR-10 turbofan jet engine that propels it at sustained subsonic speeds. After launch, the missile’s folded wings, tail surfaces and engine inlet deploy. It then is able to fly complicated routes to a target through use of a terrain contour-matching guidance system. During flight, this system compares surface characteristics with maps of the planned flight route stored in on-board computers to determine the missile’s location. As the missile nears its target, comparisons become more specific, guiding the missile to target with pinpoint accuracy. The B-52 and the AGM-86B increase flexibility to attack targets. AGM-86B missiles can be air-launched in large numbers by the bomber force. The B-52H bomber can carry six AGM-86Bs on each of its two externally mounted pylons and have been modified with a bomb bay rotary launcher which can carry an additional eight missiles for a total of 20 – AGM-86B missiles per aircraft.